This page is about the Soviet fighter Yak-3P. For other uses, see Yak-3 (Family). The Yak-3P is a rank III Russian fighter with a battle rating of 5.3 (AB), 5.0 (RB), and 5.7 (SB). It was introduced in Update 1.35. The Yak-3P is a fantastic all-around fighter. It has the manoeuvrability of an A6M, the armament of an Fw 190, the speed of a P-63, all combined into one fantastic combo. The armament is fantastic- three 20 mm Cannons mounted in the nose can rip apart pretty much every plane you will face on the 4.3 BR. However, they do not pack the punch of Hispanos or AN/M2 cannons, or the belts, for that matter. Thus, it is recommended you research the belts as quickly as possible because the Ground Targets ammunition will increase performance markedly. One great advantage of the B-20M/S Cannons is that they take much longer to jam than their American/British cannon counterparts. Watch your ammo count, its best to attack at an angle with short bursts due to hit detection problems (sparkling) when firing from a ~0-degree angle. 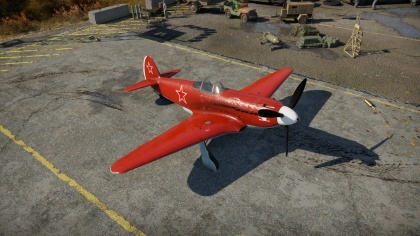 Unlike the Yak-9s and 7s, the 3P is a fully composite plane. This means the wings have higher durability than the wooden-supported Yak-9, but it is still recommended you do not push the plane's manoeuvres to the limits, as the wings will still break in a high-speed dive or manoeuvres. The engine will also overheat extremely quickly. The durability of the plane is not great. Try not to be shot at all, because even a Spitfire with 8 7.7mms can set you aflame. Like most Yaks, the 3P has good manoeuvrability, and you can out-turn pretty much everything except for the A6M, some of the Bfs, and Spitfires. Fortunately, the 3P also has another ace-in-the-hole. In arcade, WEP provides a very good rate of acceleration, so running away from a battle poses no challenges. However, the climb-rate is also pretty good, but not as great as the Spitfire or Fw 190. 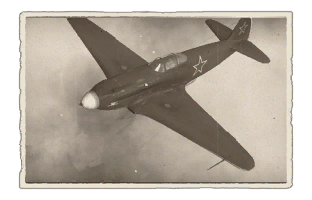 Thus, the Yak-3P is one of the best "dive-into-battle" and destroy planes. Performance is terrible above 3 km. Below that altitude performance is fantastic. In Arcade mode, this is one of the best planes available. The wings are not affected by high speeds, so you can push the 3P to the limits. However, in RB or SB, watch your speed if you use Boom & Zoom. Any speed higher than around 410 mph will cause the control surfaces to lock up and any attempt to make a hard turn at this point will break your wings. The 3P also has really bad high altitude performance, so you are limited to around 2000 km before your speed and performance drastically decrease. To conclude, the Yak-3P is one of those planes that have great armament and all-round specs. The armament is very good. With a relatively fast fire rate and a good punch, they are more than powerful enough to destroy any plane with ease in the Rank 3 level. Bombers may pose a bit of a challenge. However, just aim for the wings and fire. The fuselage will just absorb your shells. Your best shots are side-on or diving in from an angle because the armament is most effective then. The Ground Targets belt is most effective with 3 HE shells/1 API shell per cycle. As mentioned, gaining access to better belts is priority, afterwards modules which grant more horsepower are to be focused on. Good speed in level flight. Cannons weaker than German/British counterparts. Poor high-altitude performance (+2 km). Red paint scheme can be easily seen at long distances. Low wing rip speed for diving (685 km/h or 426 mph). Produced from April 1945 until mid-1946, armed with 3 × 20 mm Berezin B-20 cannon with 120 rounds for the middle cannon and 130 rpg for the side weapons. The three-cannon armament with full ammunition load was actually 11 kg (24 lb) lighter than that of a standard Yak-3, and the one-second burst mass of 3.52 kg (7.74 lb) was greater than that of most contemporary fighters. Starting in August 1945, all Yak-3 were produced in the Yak-3P configuration with a total of 596 built. This page was last edited on 7 April 2019, at 11:56.